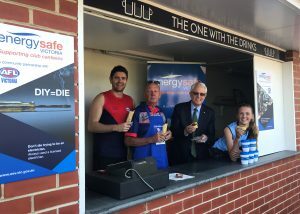 Hot pies: Director of Energy Safety Paul Fearon (second right), with St Albans FC player Ben (from left), Canteen Manager at St Albans, FC Vern and Jemma. The partnership renewal will see ESV support the growth of country football until 2019, taking the partnership to nine years. 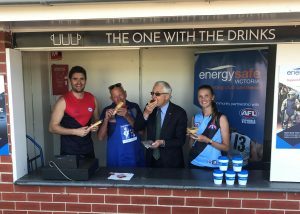 AFL Victoria chief executive Steven Reaper, said the partnership was key to showcasing the importance of being safe around gas and electricity, whether at the football club, home or work. 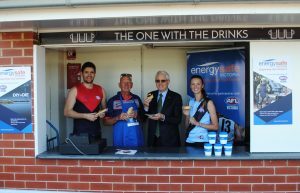 For more information and to register your club’s application for the Energy Safe Victoria Canteen Grant, click here.